I’m going to share one of the strongest stock market patterns. Every year, it leads to consistent double-digits gains in a short time. For perspective, the S&P 500 Index averages about a 10% annual return. In one of my services, we generate higher returns in a matter of months. So far this year, we locked in gains of 13%, 15% and 30%. Including a couple of losses, our average return from positions closed in 2019 is 17% — outpacing the average annual returns of the broader market. But our profits are just beginning. Plenty of gains are ahead this year. And one opportunity is on the way. If you want to beat the stock market in 2019, don’t miss this trade. Our double-digit gains so far are due to a stock market pattern we follow: seasonal trends. A seasonal trend is one of the most powerful trends in the stock market. It’s a period of the year when a group of stocks tends to rise or fall over a short time. These trends have generated our consistent gains in my Automatic Profits Alert service, and they will do so throughout the year. I call them prime seasons. A seasonal trend indicates the prime time frame to own a certain group of stocks. And a prime season that is set to rally by double digits in the coming months is health care. To learn more about seasonality watch my YouTube video below. Health care stocks haven’t done much over the last two months. They’ve been trading sideways. But my seasonal calendar indicates health care’s prime season is just getting started, and this sector is set to surge higher. The calendar also shows when the seasonal period tends to fizzle out. The health care seasonal trend will surge by the end of July. You can see that near the end of March, the seasonal trend bottoms and shoots higher through July. I expect a double-digit move in a few months. This is the seasonal trend I look to capture. Over the past 10 years, the stock my system selected to profit from this prime season has returned an average of 22%. That’s more than double the S&P 500’s average annual move, and it happens in a matter of months … not an entire year. This is the true power of seasonal trends. We can dip in and out of the market strategically throughout the year to generate massive annual returns. Here’s how you can profit from this move. 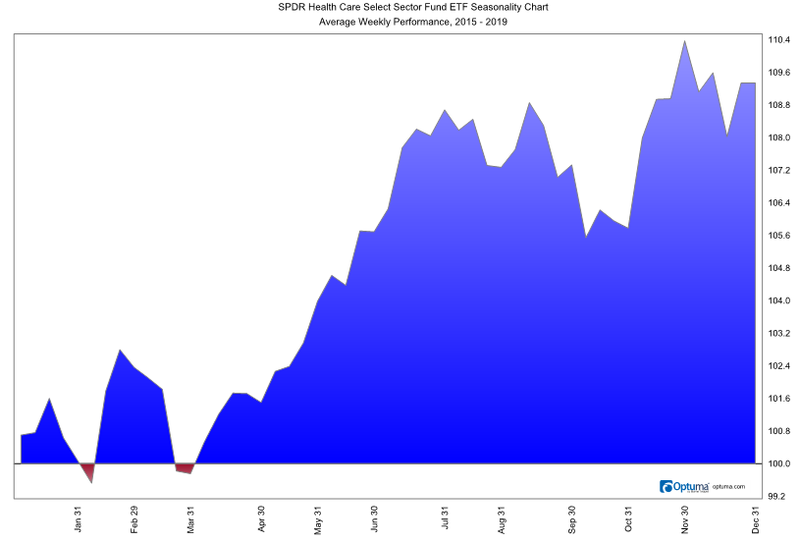 A simple way to benefit from this coming trend in the health care sector is with a health care ETF. The Health Care Select Sector SPDR ETF (NYSE: XLV) is a great one to trade. It’s highly liquid and tracks the performance of the sector we’d expect. This ETF will give you the closest return to what the sector experiences over this prime season. If you are looking for more leverage, there is a three-time leveraged ETF for the sector: Direxion Daily Healthcare Bull 3X ETF (NYSE: CURE). This tracks the sector, and you will see the ETF move three times as much as the underlying group of stocks. If you buy the leveraged ETF, just proceed with caution. The longer you hold a leveraged ETF, the riskier it becomes. Holding it for a short time is fine — you will likely not experience a steep decline. But if the health care sector plunges 20%, which is possible given the current stock market risks, this ETF would fall more than 60%. That’s because it seeks to track it on a daily basis. From one day to the next, it fluctuates more. It works for the upside as well, but don’t forget about the downside risks when trading leveraged ETFs. Now, the more promising strategy is to trade a specific stock in the sector. That’s what has averaged over 20% during the seasonal trend, and it’s the approach I take in my Automatic Profits Alert service. If you want to get our stock pick for the health care sector, click here to learn more, and join us navigating the stock market with seasonal analysis. Clean Energy Storage Demand Is Surging 1,445%!